The word logos means word in Greek. When it was used in archaic, esoteric terms it had a more specific meaning — that “Divine Essence” was concentrated in its Name. This theory of creation was passed from Tantrism to Neoplatonic philosophy, and was later absorbed into Christianity and from there, it was suggested to apply only to Jesus. The Christian enthusiasm for this idea may have been related to the fact that it provided exclusively male gods the means by which to give birth. They could just speak the word and that was that. Thus, it has become a widely known and popular theological construct. However, the ability to create and destroy with words was originally the domain of the Goddess in all her many manifestations. She created alphabets, languages and secret words of power, or mantras. Every manifestation of life was brought into being by the supreme syllable and mother of all sounds, Ohm. As our body while consisting of human members is yet held together by one soul, so the universe is to be thought of as an immense living being which is held together by one soul, the power of the Logos. Christians gave the idea a very simplistic interpretation, assuming the “body” was Christ’s. The more perceptive of the ancient writers intended to say that man, the nomothete, creates all his gods from his Word. And here we find ourselves back in the domain of the Names of God. Q: (L) How does thought become matter? Q: (L) What do you mean by “bilaterally”? A: Not “into what and what”, but rather, “from what and to what”. A: 7th density, i.e., all that is, and is not. Q: (L) In terms of major STS, this may or may not be related, could you tell us the nature of a Black Hole? A: Grand Scale STS. Black Holes are a natural force reflection of Free Will consciousness pattern of STS. Notice that Black Holes are located at center of spiral energy forces, all else radiates outward. All in creation is just that: a radiating wave. Q: (L) Where does the energy go that gets sucked into a black hole? A: Inward to total nonexistence. Universe is all encompassing. Black holes are final destination of all STS energy. Total nonexistence balances total existence. Guess what is total existence? “God.” Prime Creator. As long as you exist, you are of the Prime Creator. Q: (L) Now, this stuff that goes into Black Holes, that goes into nonexistence, is that, then, not part of the Prime Creator? Q: (L) How can Prime Creator lose any part of him or itself? A: Prime Creator does not “lose” anything. Q: (L) Well, then, how would you describe this energy that was in existence and then is no longer in existence because it has become or gone into a Black Hole? A: Reflection is regenerated at level 1 as primal atoms. 1st density includes all physical matter below the level of consciousness. Seventh density is union with the one… it is timeless in every sense of the word, as its “essence” radiates through all that exists in all possible awareness realms. And, remember, there is only one “God”, and that the creator includes all that is created and vice versa! Q: (L) Do these beings have a name? A: No. They are Transient passengers. Q: (L) What is the meaning of this term and who are these beings? Q: (L) Are the sixth density Orions, also known as Transient Passengers, are they the same Transient Passengers that have been referred to as the ones who genetically engineered us or put us here? Q: (L) Is “riding The Wave” part of the definition of Transient Passengers? A: Is it “fun” for you to live on earth? Q: (L) Well, I like living on earth a great deal, but I don’t like pain and suffering, and I don’t like man’s inhumanity to man and I don’t like to see other people suffer. Q: (L) I see what you are saying. That’s where they live because that’s where they live. Q: (L) Are there Service-to-Self beings at sixth density that some call the sixth density Orions? Q: (L) So, in addition to STO, there are STS at sixth density which balance? And they are just there, they exist? A: Yes. Don’t deify us. And, be sure all others with which you communicate understand this too! Remember: 1st density includes all physical matter below the level of consciousness. 6th density is uniform in the level pattern of lightness, as there is complete balance on this density level, and the lightness is represented as knowledge. 7th density is union with the one… it is timeless in every sense of the word, as its “essence” radiates through all that exists in all possible awareness realms. The light one sees at the termination of each conscious physical manifestation is the Union, itself. Remember, 4th density is the first that includes variable physicality!! Ponder this carefully!!! And, remember, there is only one “God”, and that the creator includes all that is created and vice versa! Now, let’s form a little hypothesis here — a working model. Let’s say that Unified Thought Forms at sixth density are the Names of God. This is a level of pure consciousness; the Platonic level of ideas, or essences or noumena. The sixth density level of knowledge of all would be just “below” the One at seventh density. We would call this the Name of Knowledge; it is the logos or “word” that engenders all existence. It could be symbolized by the ancient yin-yang symbol since it includes all of the Names. It could also be symbolized as the universal hermaphrodite or androgyne. It is the “Two in One” where the work of generation begins. It is the first manifestation of the eternal parent and is a bisexual universal being. It combines within itself the elements and principles of both masculinity and femininity. However, we have to note the distinction between knowledge of all and the Wrathful and Beautiful Names. In trying to think through this idea, I wanted to have a visual image. I struggled for months to think of a way to present it with little success. Finally, it occurred to me that the Cabalistic Tree of Life might be a useful form to work with. I found an image in a book and it didn’t seem quite the thing, but I thought I could play with it a bit, modify it, and get it to do what I wanted, so I scanned it onto the computer. When I did, the way the scanner was sitting forced me to place the book upside-down. When the image came up on the screen, upside-down, I immediately recognized that this was useful! So here is my little modification of the Tree of Life that represents the cosmos, or body of God. Now, the next thing we want to consider about this vertical axis is the placement of the sixth density level of Knowledge on the vertical axis as a mirror image of the placement of second density as the realm of nature, that is, flora and fauna. There is an important key here that we must realize. If sixth density is “uniform in the level pattern of lightness, as there is complete balance on this density level, and the lightness is represented as knowledge”, then we must think of the realm of nature as being the physical reflection of this principle. That is to say, nature — all of creation — is a reflection of all of consciousness. We also notice that second density is only able to recycle through fifth density in order to graduate to any of the other densities, and this is reflected in our observations of nature. We do not ever see any creatures from the animal kingdom suddenly developing self-consciousness in the sense of the nature of human consciousness. Actually, we don’t necessarily have any hard evidence that it is possible for humans to graduate to the higher densities which might be indicated by the lateral axes in the figure that show direct channels between third, fourth and sixth densities. Yet we have been told that this is possible; there is circumstantial evidence in esoteric literature that this has occurred. We do have some idea that certain divine beings who have appeared throughout history have a more or less human form. So we might assume that, generally speaking, there is not so great a barrier between our third density state and the higher densities as there is between second density and the densities that are reflected in human self-consciousness and awareness. So, second density is shown without a direct conduit to the higher densities except through fifth, the “recycling zone”. One thing that occurs to me as I look at this little modification of the Tree of Life is that it sure seems to model and define in pretty simple and precise terms the relationships we are coming to understand about our reality, as well as the potentials for moving from one point on the Tree to another. But, don’t think that I have even begun to analyze and think of all the possibilities. I am hoping that the reader will see things that have not even occurred to me. It should be understood, again, that the conduits of connection are actually hyperdimensional in nature and not really separated as they appear on the model. Not only that, but the two lateral axes identified as STS and STO represent literally infinite dimensions in number. These dimensions can represent different Names of God and their extensions down through the densities either as single individuals or as groups of individuals. However, there is always balance, so for every STO axis there is an equal and corresponding STS axis. Another thing that occurs to me as I examine the relationships is that from any of the lateral axes, by accessing nature/knowledge one is also aligning with the vertical axis of Being which could be defined as the axis of gravity within each of us. Perhaps by aligning with this axis, one could theoretically open a doorway into this axis. Once one was in this axis, one could then open a doorway into any of the other positions of either the lateral or vertical axes. Of course, talking about it and doing it are two different things! Apparently this is one of the aspects of the great Work of alchemy. And in studying alchemy we find some warnings that would do us well to heed. The alchemists wrote that the study and contemplation of the metaphorical philosopher’s stone along with the chemical work was a necessary component to elevate the mind and prepare the soul for transmutation. Man’s quest for gold is often his undoing, for he mistakes the alchemical processes, believing them to be purely material. He does not realize that the Philosopher’s Gold, the Philosopher’s Stone, and the Philosopher’s Medicine exist in each of the four worlds and that the consummation of the experiment cannot be realized until it is successfully carried on in four worlds simultaneously according to one formula. The alchemical literature includes stories of alchemists who blew themselves up, who suffered horrible diseases, who came under the power of demonic influences because their technical abilities surpassed their spiritual development, or who shot to stardom like a meteor, and then crashed and burned in ignominy. A: Each soul has its own patterning, which is held in place by the three bodies of existence “thought center, spirit center and physical center”. There are specific methodologies for adjusting these, and traveling into or out of other planes of existence. When one does not properly utilize these, one tears the fabric of their trilateral continuum when they seek to travel. This can be very problematic, and may lead to the soul being unable to reconnect with the body, thus causing the physical center to perish!!! They have also spoken of the “four worlds”. A: And remember, your consciousness operates on four levels, not just one! [They are] Physical body, genetic body, spirit-etheric body, and consciousness. [These are] the four composites of the human manifestation in 3rd and 4th densities. Now, as I pondered these things, it occurred to me that this modified Tree of Life could be used to represent each individual human being since, as the Cassiopaeans have pointed out, all of creation exists within each and every one of us. When we align with the central axis, we are aligned with seventh density, which is the origin of all other engendered beings, and we thereby have access to all of Creation in very literal terms. However, since man is a mirror image of God, we now need to reverse the image as the Cabalists constructed it with, again, my little modifications. Now, look at this Tree. Note that, on the vertical axis, below the level of Union with the One, or seventh density, there are four positions. If this is the relationship we are looking for, then we see that the physical body relates to first density matter, the genetic body relates to second density, the spirit-etheric body relates to fifth density, and consciousness relates to sixth density knowledge. At the same time, we always retain our connection to seventh density, so that must be considered the pivot or “true dimension”. Q: (L) Physicists talk about multi-dimensional universes. The idea is that our three-dimensional space and one-dimensional time is an illusion of plane beings, while the true universe has more dimensions perpendicular to the above ones. Physicists have different guesses here: 5, 6, 7, 11, 256. How many dimensions does the true universe have? A: For those who know how, universes can be created at will in order to transmodify reality merge. Q: (T) Merging of realities from one universe into another? A creating of a new reality which is then merged with the old to create a new universe. (L) Maybe it means the realities of different people merge to create a sort of “mutual universe”? Like the idea “you create your own reality”? A: Yes, but the Terran scientists have been programmed to believe that nothing can exist unless it can be measured, estimated, calculated and represented in some way in the physical material plane. Not true!!!!!!! For example: We are in no way physical. Q: (L) Well, I also want to know why you refer to a technological device that supposedly transports someone from one density to another, as a “Trans-Dimensional Atomic Remolecularizer”? A: In order to reconstruct 3rd density into 4th density physical, other dimensions must be utilized in the process. Remember, we are talking about exact duplicates which are merged. Q: (L) If the former one continues to exist, does it exist and evolve on its own, disassociated with the second one, or this offshoot? Q: (T) The universe you are in: you are going along and say, “I think I will create a new Universe”. You do it, and move to it, and you bring your universe with you. That is the merging of realities. But, when you move to the new universe, you are no longer in the original one, which continues along on its own. The pattern of the old universe, you bring into the new one, and when you become part of the new universe you have just created, you are no longer part of the old one you just left which just goes along with everybody else there, only without you. Is this possible? Q: (L) That still doesn’t help me to understand deja vu as a “sensation of reality bridging”. Is deja vu because something comes into our reality from another? Q: (L) So it can be any and all of those things, and bridging realities of “past” and “future”, as well. Is it possible to change the past within a discrete universe, or does every change imply a new or alternate universe? A: Discrete does not get it. Q: (L) Well, within a particular, selected one of the universes, can you go back in time, within that universe, change the past, and have it change everything forward, still within that selected universe, like a domino effect? A: In such a case, yes. A: That is for specialized activities. What was described is not the same as an “alternate universe”. Q: (L) Is it that any and all possibilities will and do take place? Q: (L) Are the words “universe” and “dimension” synonymous? A: Yes and no. For you, these are “gray” areas, and no matter how hard you try, until your perception shifts fundamentally, you ain’t gonna get it! A: One is variable. Three ethereal. Q: (L) Okay, three that are physical, three ethereal, and one in between that is both. Q: (L) Is awareness the only thing that determines what density one exists in? A: No. Awareness is the bond that unites the reality. Q: (L) You have said that gravity is the binder of all reality. Q: (L) And now you talk about perception bonding. A: Not exactly. Did you know that there is no “right” or “left” in 4th density through 7th density? If you can picture this exactly, then you may be able to understand the responses to all the questions you are asking. If not, best “give it a rest”. Because it will only be productive learning when you ponder and reflect/review “later”. Regarding the three worlds, divine, human and elemental — or, as the Cassiopaeans put it, the soul’s three bodies of existence: thought center, spirit center, and physical center — we look again at the tree and note that each of the lateral axes has three positions: sixth density, fourth density, and third density. In other words, our third density physical body is directly connected to our spirit center at fourth density, which emerges from the sixth density thought center, which is the level of the Names of God. However, in keeping with our mirror image of the cosmic tree, we have designated the two axes as STS (entropic) and STO (creative). On the STS axis, beings that graduate become more and more “encapsulated” until, at fifth density, they exist completely in entropic thought with no activity whatsoever. At some point, these contractile energies gain sufficient “weight” to graduate to sixth density, at which point, in contact with knowledge of all, they perceive their true function which is to regenerate at level One as primal atoms. They become matter. This occurs at the same instant that STO energies have gained weight on an opposing axis, and rise to union with the One. In short, a constant cycling. Q: (L) You say it is a natural thing or part of a natural grand cycle. Is this natural grand cycle just part of the interaction between light and darkness, which just simply must be? Q: (T) This battle goes on… do you have the light power back? A: Never lost it, you did. Q: (T) When we put out energy as positive or negative energy, there are beings on other levels that feed on this energy. Is this true? Q: (T) Okay, and you said that the Lizzies feed on the negative energy? Q: (T) Who feeds on the positive energy? Q: (T) How do we feed on the positive energy? A: Progression toward union with the one, i.e., level 7. Q: (L) In other words, you fuel your own generator instead of fueling someone else’s. (T) You are at level six, what do you feed on? A: You have the wrong concept. We give to others and receive from others of the STO. We feed each other. Q: (L) So, by feeding each other you move forward and grow but those of the STS path do not feed each other so must feed off of others. (T) Now, you are talking to us now. This is considered STO? Q: (T) We are providing energy for the channel also, does that provide you with energy? Q: (L) What do you want from us? A: We don’t want when pure STO. We came because YOU wanted. But that is STS until you share with others. Q: (B) What is the purpose of this contact? Q: (B) What do the Cassiopaeans gain from this contact? Q: (B) Is this the only probability open to you or is this the best probability open to you? Q: (B) Are you a great distance from us in light years? Q: (B) Light years is third density? Q: (B) What do you mean by traveling on The Wave? Q: (L) Whose thoughts are they? A: Thoughts unify all reality in existence and are all shared. Q: (S) You travel on a wave of energy created by all thought forms? Q: (B) Have those that are STS acknowledged that those that are STO are going to win in this race or conflict? Q: (B) What happens to them when they lose, does this mean that they are degaussed, or does that mean that they have to go back and do the whole evolutionary process all over again on the other polarity? Q: (B) So, there is a nexus point coming up? Q: (B) At that point do they experience the pain that they have caused? A: No, that is what happens on 5th level only. A: Remember, most all power necessary for altering reality and physicality is contained within the belief center of the mind. This is something you will understand more closely when you reach 4th density reality where physicality is no longer a prison, but is instead, your home, for you to alter as you please. In your current state, you have the misinterpretation of believing that reality is finite and therein lies your difficulty with finite physical existence. We are surprised that you are still not able to completely grasp this concept. Q: (L) Who created the Lizzies? Q: (L) And who is this individual? Q: (L) Can you give us a little more of a clue? A: Another sector of reality. Q: (L) Is this a sentient, self-aware being that created the Lizzies? Q: (L) And who created this Ormethion? A: Not being. Thought center. One thing we notice is that thought centers are slightly different from unified thought forms that are identified as transient passengers. 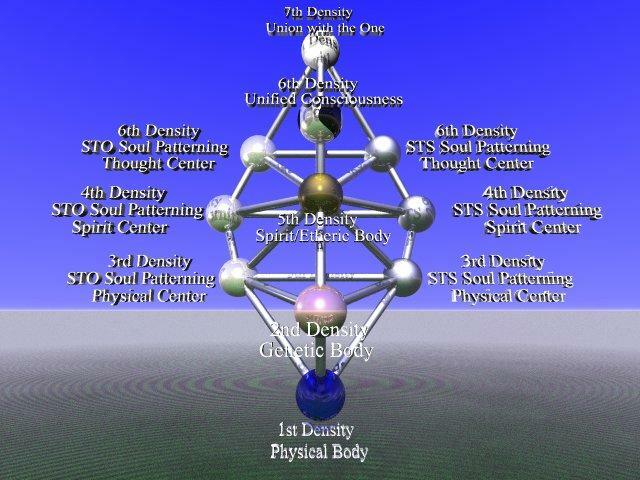 This is another clue that our Tree of Life model is set up correctly, since the unified thought forms would exist at the sixth density level of knowledge, which contains the thought of STS for balance, but no STS unified thought beings, so to say. But, the thought center realm is apparently a sixth density level of being in a relative sense. The difference is easily identified by looking at the tree. The sixth density thought center for STS does not transit all densities and realities — it is restricted to the STS realm. The same is true for the purely STO thought center level — it is restricted to the STO realm. However, the sixth density unified consciousness level is located on the central, vertical axis as the logoic offspring of seventh density. Q: (L) If you have a thought center, how do thought centers relate to seventh density, the One? Q: (L) Are thought centers seventh density? Q: (L) All is thought centers? A: No. All is 7th density. We have told you before that gravity is the foundational force of absolutely everything!!! This means at all density levels, all dimensions… It is the “stuff” of all existence. Without it, nothing would exist. Your thoughts are based in gravity, too!! Q: (L) What is this geometric figure? A: Was a visual representation of the conduit, indeed!!! The reason for such clear luminescence is that thought centers were clear and open in you at the moment of the photograph. In other words, there was an imbalance of energy coming from 6th density transmission point. This suggests that I was in a state of total non-anticipation at the moment of the photograph, which allowed a sort of “zero-point energy” function to activate in a psychic way. But, more importantly, it suggests the idea that we are connected via some sort of conduit to these archetypal thought centers as depicted in our Tree of Life image. We might think, then, that the lateral axes represent dimensions resulting from various thought centers. And, again, we cannot limit them to just two, since they may be infinite even if they do fall under the general categories of STS and STO or the Wrathful and Beautiful Names of God. Q: (A) Which part of a human extends into fourth density? A: You don’t get; you receive. A: Energy and aether are directly symbiotic. “Aether” is Terran material science’s attempt to address ether. The trouble is, there is simply no way to physicalize a plane of existence, which is composed entirely of consciousness. It is the union of perfect balance between the two “states” or planes that is the foundation and essence of all creation/reality. You cannot have one without the other! A: Yes, connected, intertwined, bonded… Merged. Q: (A) When this aether-energy-matter vibrates, then in which dimension does it do this? A: The densities three and four at transition junction. Q: (A) I am trying to understand the universe in terms of a triad: matter — geometry — information. Is it the right idea? A: If one thinks of matter as “living” rather than “dead”. And now, when you merge densities, or traverse densities, what you have is the merging of physical reality and ethereal reality, which involves thought form versus physicality. When you can merge those perfectly, what you realize then, is that the reason there is no beginning and no end is merely because there is no need for you to contemplate a beginning or an end after you have completed your development. When you are at union with the One at Seventh density, that is when you have accomplished this and then there is no longer any need for difference between physical and ethereal forms. This brings us back in a curious way to the study of nature — all of Creation — as a means of drawing closer in alignment with the central, vertical axis. By invigorating the Organs the Soul uses for communicating with exterior objects, the Soul must a acquire greater powers not only for conception but also for retention, and therefore if we wish to obtain still more knowledge, the organs and secret springs of physical life must be wonderfully strengthened and invigorated. Stones were once utilized to provide for all needs, as the energies transmitted connected directly with the pituitary gland to connect spiritual realities with the material realms of 3rd and 4th densities. So you see, the ‘stone’ was viewed as Matriarchal indeed! The study and contemplation of the metaphorical “Philosopher’s Stone” along with the chemical work was a necessary component to elevate the mind and prepare the soul for transmutation. A: Not wise. You could fry yourself in your zeal. A: First of all, “chakras” are a little understood and nonproven phenomenon. Now, it just so happens they do exist, but in different form than reported by many in the so-called “psychic” community. Q: (L) What, exactly, is a chakra? A: An energy field that merges density one, two, three or four with five. You are all connected with level five when you are on a short wave cycle. Chakras are the connection with physical imprint locator. 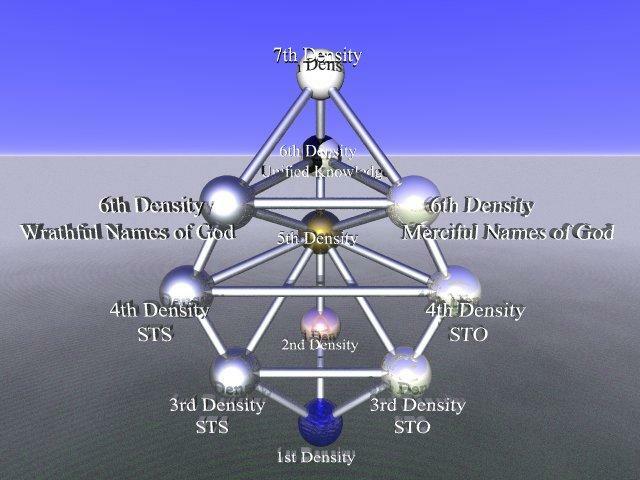 Getting back to our hypothesis about archetypes, centers, and Names of God, let me propose that fourth density is a realm where the archetypes are embodied in group souls. These group souls then have extensions of themselves into the third density reality in the same way a hand has five fingers. Only in these projections, each finger is a different lifetime of an individual soul, which lifetimes are not limited to sequential experience; and we cannot limit the number of hands or fingers. In this sense, it could be said that third density is a projection of sixth density through the “lens” of fourth density. Q: (D) When fourth density beings communicate it’s telepathic, right? Q: (D) Okay, since time doesn’t exist, how do you communicate about happenings? If you’re communicating telepathically on fourth density, and time doesn’t exist, how do you communicate about events as one happens now, as opposed to later, and the next thing happens, and the next thing happens? (J) How is it sequential? A: That is how it is done. Q: (T) You translate the experience? A: From 4th density to 3rd density. And vice versa. Now, each of these archetypal qualities or Names of God manifest on fourth density in archetypal dramas. This relates us back to Mircea Eliade’s concept of the archetypal gesture — illud tempus — from the beginning. This expresses the idea that the world in which we live is a form, or reflection or double of another cosmic world that exists on a higher level. These were celestial archetypes. A: Whom does Zeus represent? Q: (F) The father of the gods? A: And the implication is…? Q: (L) Does Zeus represent seventh density? A: Or does Zeus represent the grasping for 7th density? Q: (L) Are we saying grasping in ways that are not suitable? A: No grasping is “not suitable”. Q: (L) Okay. Are we all pieces of… are there groups and groups and groups that are pieces of a larger whole, or larger wholes, and they can only graduate when they assemble? A: More to the point would be that that makes the progress speed up for most of those involved in such a process. Q: (C) Are we part of a group soul or group entity? Q: (C) I think that we are part of a group soul… whatever that means, we have a purpose; I think we have a similar interest, and that is to discover the truth. And it is also to advance us. A: How does it “filter down”? Q: (C) Because I believe that all are connected. Q: (L) I get it! The Zeus thing. The whole Zeus thing, the bearing of children, the moving out in all these various ways, manifestations or patterns as defined by the “children of the gods” through all the various levels, so that it eventually all comes back around to seventh density. A: and what does it mean when it “comes back around”? Q: (L) Union with the One. And it all just keeps going around and around. Q: (C) If we are patterned after the myths of Zeus, and we have gone forth, and there are lots of smatterings of fragments upon the earth having many experiences, and as we grow and advance, we come to the truth and the full meaning, we merge back together again with all of the wisdom of all of these experiences. A: Yes, but is not just the “Earth”. Q: (C) They are in the same process. Q: (C) Do they have different myths? A: They have different everything… But, in the final analysis, it is really just the same! Q: (C) Then I would say that when everyone graduates from their finite, physical existence, then they occupy the same space at a different vibration, and go onto other lessons and experiences and advances that I cannot conceive of at the moment. A: But what is “the moment”? Q: (C) The moment? I haven’t thought that far ahead yet! A: Or have you, but you simply do not perceive it as such? Q: (C) Probably so. How many people are in this particular group that Laura and I are in, for the purpose of this work? A: Up to you to discover. Q: (C) Well, I thought I’d give it a shot! Thinking is electrical. Does a person leave an electrical echo and can certain combinations produce harmony which is cumulative and exponential, thereby certain groups thinking can produce more than others, or individually? A: Close. Now, Suggestion: Combine frequencies to witness the development of a directed wave effect; packs a potent “punch”. Q: (LC) I’m really curious. I feel like all of us here have been drawn together for a reason. We had a hell of a time getting here, every one of us, but we did, and I’m just wondering what is this all about? Why did all of us feel so drawn that we just had to be here? A: You are not wondering so much as you are seeking confirmation. Q: (LC) I don’t know. I just feel something powerful. A: Every one here thinks on more than one level. This already puts everyone into a different category than the status quo. You all have quite well developed senses, a more difficult task is learning to trust the messages. Remember, you all have received negative programming at the third density level, which is designed to derail your higher psychic awareness. You by now know that this is false programming, but we realize that the subconscious centers are more difficult for you to overcome. Patience will pay off for you big time!!! Q: (L) Are you suggesting that that we are all part of the same soul unit here? A: Yes, we are! To an extent, but you may not yet understand what exactly a “soul unit” is in that sense. And of course, there is more than one sense for this as well. The “trick” that 3rd density STS life forms will learn, either prior to transition to 4th density, or at the exact juncture, is to think in absolutely limitless terms. The first and most solid step in this process is to not anticipate at all. This is most difficult for you. We understand this, but this is also why we keep reiterating this point. For example, imagine if one of your past lives is also a future life? Q: (P) Now, I just want to say that I think that we have all of us here traveled back in time to change the way things are now. We inserted ourselves into this time period to wake up and see what is really happening. This is third density thinking, I know, but it is the only way I can describe it. We looked back on the way things happened, the way the world is now, and we have come back to change things. We have come from the future, to wake up now, because we didn’t wake up before. Because the world is going in this direction, and something had to be done. That’s what I see. Not just that, things happen to keep us from waking up period! We’ve all been bombarded with stuff all our lives. A: That is surprisingly close to the truth. Now just a moment… reflect please. A: Maybe for some of you, but let us not get ahead of ourselves. A: Close, but more complex than that. It would be difficult for you to completely understand at this point, but let us just say that you are close. You should reflect upon all that is in the reflection! Q: (L) What is the reason for the use of the term “reflection”? Q: (L) When she went through the mirror, she was in an alternate reality. (I) Are we in an alternate reality? A: Yup. But then again, are not all realities “alternate”? We encounter in these myths the idea that man only repeats the acts of the gods; his calendar commemorates, in the period of a year or other longer cycles, all the cosmogonic phases which took place in the beginning or which take place repeatedly at another level of reality. Myths are only a much later formulation of an archaic content that presuppose an absolute reality, or levels of reality that are extra-human. If we begin to think that our reality is but a sort of slide show projected from a hyperdimensional realm, we have to begin to think about the archetypal dramas themselves. If we come to the idea that we are extensions of our higher selves, fulfilling the purposes of the great cosmic dramas, we come up against a couple of important concepts. You should know that the divine call includes believer and unbeliever, obedient and disobedient. … This call derives only from the divine names. One divine name calls to someone who is governed by the property of a second divine name when it knows that the term of the second name’s property within the person has come to an end. Then this name which calls to him takes over. So it continues in this world and the next. Hence everything other than God is called by a divine name to come to an engendered state to which that name seeks to attach it. This gives us a clue as to the true extent of our so-called free will. Basically, it amounts to the fact that we can identify which archetypal drama we are living and acknowledge it, witness it in our mind, and accelerate or extend the concluding of it. We accelerate by our obedience to the call or we extend it by our rejection and disobedience. In the first case, the outcome can be felicitous if we are careful to finish the drama within the archetype, even if only symbolically, which is often the wisest choice in the event of being caught in a drama of great negative potential. In the second case, we can refuse to acknowledge the drama, continue to struggle against it like a bug striking a window over and over again, and be wretched as a result. Of course, the problem many people have is in understanding they don’t have to remember their past lives in order to learn. The soul has a memory of its own. Q: (L) Okay, let me ask this question. In talking about time, I would like to ask, in relation to time, what is memory? Some understanding of time refers to it as the “now”, the ever-present now. Well, a lot of people remember a lot of other “nows”, some people don’t remember any “nows” at all, and it seems like memory is almost like a reverse function of anticipation. Anticipation being almost like a memory of the “future” and memory being like a reverse anticipation into the past. So, what I would like to know is if time is merely a “now”, what is memory? Q: (L) Okay. If memory is subconscious or conscious recording of perceptions, when one accumulates a sufficient amount of memory, does one then become “timeless”? Q: (L) Okay, but does one then become aware of one’s timelessness? Q: (L) Okay. Does an electron have a memory? Q: (L) All right, in the picture of the crop circle you designated as being “Atomic Structure”, there was the concentric circles and then these three things on the outside corners of the triangle, one being zigzag, one being plain and round, and the other one kind of like a wheel, it had like little divisions. Would the zig-zaggy one be the electron? A: Elemental defines singular body of structure. Within, as in: “element of”. Electron is element of atomic structure. Q: (L) If memory is conscious and subconscious record of perception, as you have stated, and there occurs a “reality merge”, as you also described previously, some sort of time manipulation, does this automatically change individual perceptions? A: Perceptions “leap” into place according to markers in the eternally present continuum. Q: (L) What are these markers? A: Experiential breaks in the perceptual realm of continuance. A: The definition of the previous responses will become clear for you only after some reflection, my dear! Q: (L) Okay, you said that memory is subjective and an atom is not. If memory is subjective, what you have just been describing means that each and every person has a slightly different perspective, even if they are involved with the same incident or the same time sequence. A: Of course! That is the treasury of learning. Q: (L) Who is the treasurer? Q: (L) But still, what you said still implies that an atom has an objective existence. Is this correct? Q: (L) Would you please tell us what constitutes objectivity? A: The effort on the part of the observer to leave prejudice “at the door”. Q: (L) How does the effort on the part of the observer to leave prejudice at the door relate to the objective existence of an atom? A: An atom, as with absolutely everything else, cannot exist without an observer. Q: (L) So, in the case of the objectivity of an atom, if the human observers are not objective, where is the observer who makes the atom objective, or does the atom not exist if there is no observer? A: Yes to the latter comment. Q: (L) So there must be an observer. Must the observer be human? A: The observer must be a consciousness. Q: (L) If you say that an atom has an objective existence, yet it only exists if it is perceived by a consciousness, then an atom does not have an objective existence, correct? Q: (L) Okay, what is the distinction? You say that objectivity is the attempt on the part of the observer to leave prejudice at the door. A: Without consciousness, there is neither objective nor subjective!! Q: (L) So the crux is the attempt to leave prejudice at the door in the same manner as one would be non-anticipatory in order to create? Q: (L) Well, that is a very tricky… (A) Is consciousness objective? A: Consciousness is objective, until it has the capacity to choose to be otherwise. Q: (L) What is the stimulus for the change, for the giving of the capacity to choose? A: The introduction of prejudice. Q: (L) In a cosmic sense, cosmic consciousness, in the sense of The One Unified Consciousness, what is the stimulus there for the ability to choose? A: When the journey has reached union with The One, all such lessons have been completed. Q: (L) But, that doesn’t answer the question. In order to respect the principle of hermetism adopted by the Tradition, we must understand that esoteric teachings are given in a sibylline form. St Isaac the Syrian points out that: The Holy Scriptures say many things by using words in a different sense from their original meaning. Sometimes bodily attributes are applied to the soul, and conversely, attributes of the soul are applied to the body. The Scriptures do not make any distinction here. However, enlightened men understand. This is the point at which we begin to understand our reality. The Celestial myths are the archaic representations of the archetypes. In studying these stories and their characters we can have access to very deep knowledge about any human situation or drama in which we may find ourselves. We can also identify which character, or part, we are being activated to play. Once we have identified the drama of the moment (which may extend over years or even an entire lifetime, or merely be a mini-drama of a few minutes, hours or days’ duration), we can fully activate our participation with some degree of control. By recognizing the play, by acknowledging our part, we have formed a link between ourselves and the director, producer and writer of the production at higher densities. We are psychically linked to them in a real and symbiotic way. And, by being linked, we can have access to a free will that is not ordinarily accessible. Joseph Chilton Pearce was aware that there was something deeper and more involved in our reality than many suppose, and he called it the Cosmic Egg. Well, he may have been more right about this than he ever suspected. If thought centers are cosmic eggs laid from sixth density into fourth density via fifth density, and hatched into third density, then we have only one issue to deal with at this density, and that is which egg is ours? More than that, if we don’t like the present egg, can we crack it and get out? Q: (L) When we are talking about dimensional curtains we are talking about divisions at the same level of density, is that correct? Q: (L) What defines this change? A: Catch 22: One half is that you have to change your assumptions in order to experience The Wave in a positive way. All is merely a lesson, and nothing, repeat nothing, more. How do we get the experiences that will change our assumptions? Well, let’s look at our Tree of Life again. We notice that in both versions, the cosmic and the human mirror, the different densities “recycle” through fifth density on the central axis. There does exist a sort of conduit between the centers, but these conduits do not have an exchange point on the central axis that would facilitate a shift of thought centers or assumptions. From this we can conjecture that it’s somewhat difficult to change polarity without some sort of facilitator. This is why the way of the Monk, the Yogi and the Fakir are so difficult. They attempt to bridge the gap without a facilitator on the Central axis. We notice that, on the cosmic tree, the position of knowledge is a facilitator for the cycling of sixth density energies to move into union with the one which is, in effect, an instantaneous (or timeless) Being and Non-being. This then initiates a new cycle of consciousness that regenerates as dense matter and consciousness that emerges bilaterally into the Beautiful Names and Wrathful Names of God to initiate the drama all over again. When we look at the human Tree of Life, which is the mirror image, we see that the position of knowledge is now held by the genetic body, which is on the central axis. We then realize that this is our facilitator. The genetic body is the control center for the physical body since it transduces the central axis energies, so whichever thought center is dominant will control the physical experience. Not only that, but we can see another possibility — namely, that knowledge and genetics are directly interactive. At the third density level, genes are the logos. Sounds like cosmic chromosomes! It is through our genetics that we have the potential of aligning with the central vertical axis and changing thought centers. And, just as second density nature is a reflection of sixth density Knowledge in the cosmic tree, so is our genetic code the second density reflection of all that exists as potential within us as human beings. It could even be said that all of nature exists within us. A: As third density bioengineered beings, you lead the smorgasbord parade of that which surrounds you in the physical realm. Each individual possesses all of creation within their minds. Each soul is all powerful and can create or destroy all existence if know how. You may create alternative universes if you wish and dwell within. You are all a duplicate of the universe within which you dwell. Your mind represents all that exists. It is “fun” to see how much you can access. Challenges are fun. Where do you think the limit of your mind is? If there is no limit, then what is the difference between your own mind and everything else? And when two things each have absolutely no limits, they are precisely the same thing. Is that so? You see, our genes are more or less encoded copies of all the possible dramas of which we can be participants. Much of this information is like closed books, stored in a room that is never opened. We have the potential, via knowledge and exercising certain functions, to open these books and link up with the central axis and thereby make a shift in the essence or Name by which we are dominated. And in doing this we have the possibility of participating in a different drama, myth or fourth density movie being projected into third density. A: Yes, there is reincarnation. You are getting ahead of yourself there. We never said there is no reincarnation. Q: (SV) But, if there is no time? (L) It is all happening simultaneously. We are having all of these lifetimes at once. (SV) Is there a way that we can connect ourselves with all our other selves? A: Picture it this way: we will access some of your memory banks and give you another reference… you know what a slide projector looks like? To give you some feeling of what this expanded nature of reality really is, picture yourself watching a big slide presentation with a big slide wheel on the projector. At any given point along the way you are watching one particular slide. But, all the rest of the slides are present on the wheel, are they not? And, of course, this fits in with the perpendicular reality, which fits in with the circles within circles and cycles within cycles, which also fits in the Grand Cycle, which also fits in with what we have told you before: All there is is lessons. That’s all there is and we ask that you enjoy them as you are watching the slide presentation… and, if you look back at the center of the projector, you see the origin and essence of all creation itself, which, is level seven where you are in union with the One. Q: (V) Do I feel this despair due to past life issues or due to this life? A: Both. Like another “slide” in the slide projector carrousel. Q: (V) What? (L) In the carrousel of many lifetime issues? A: Yes you can, and it would be wise if you did. You see, V***, there is nothing preventing you, or anyone else for that matter, from falling into the correct slot of their balanced contentment learning profile, but simply advancing that carrousel until the correct slot aligns, then just falling, or “sliding” into place! Q: (L) You use this allegory; what would consist of advancing the carrousel? A: Discover… because learning is fun! Q: (L) Is there a physiological relationship to this carrousel, or is it just strictly psychic, psychological, or learning related? A: Hide and seek, locate and retrieve. Here we have one of the major clues to how it will help us to study nature. If our genetics are the physical interface between us and the vertical axis, if they are the physical manifestation of the thought centers through which our existence is extruded, then we might very much want to examine nature and the creatures within it in order to be able to determine just exactly what potentials we may be enacting, what potentials we can activate that may not be activated, and how to suppress those potentials that belong to thought centers that we do not choose to be the arbiters of our destiny. We can study nature and discover what archetypes are manifested in our lives and, if we don’t like the script, we can discover the ways and means to change the selection, so to speak. That means that we can create our own reality in the sense of changing channels in terms of which thought center is in control of our lives. It also means that we can have a choice as to which face of God we behold! Like attracts like. When a candidate has developed virtue and integrity acceptable to the adepts, they will appear to him and reveal those parts of the secret processes which cannot be discovered without such help. Those who cannot progress to a certain point with their own intelligence are not qualified to be entrusted with the secrets which can subject to their will the elemental forces of Nature. In the study of nature, we have been given a tool, a means of assessment that, if used rightly, can lead us to make felicitous decisions that activate our DNA in ways that align the three worlds of our soul centers with the four worlds of our bodies of existence. Q: (L) Okay, let me jump over to this other subject of the number 33 and the number 11. Is there anything beyond what was given on 11-11-95, that you could add at this time, about any of the mathematics or the use of these numbers? Q: (L) What do you mean, “prime numbers are the dwellings of the mystics”? A: Figure of speech. [Planchette spirals several times, vigorously] And how interesting that we have a new “cell” phone company called: “Primeco”. Q: (L) And how does a cell phone company called “Primeco” relate to prime numbers being dwellings of mystics? We stopped at this point and did a little exercise in word association. Some of the words we came up with were: encryption, cells of monks, prisons, prime number divisible by one or self. A: Ever heard of a “prime rib”? A: What happens in a “Primary”. A: “Prime Directive”? “Prime time”? Q: (L) I know that’s not the point! Is what we’re saying here, is that we can use these prime numbers to derive something out of something else? Q: (L) So, mystics… the mystics, the mystical secrets… dwell in the prime numbers if used as a code. Q: (L) All right. With our little list that we’re making, are we on to something or are we completely off track? A: Yes, now check out those crop circles photos… any prime number combos there? A: Composition and dimensions… anything you can find. We stopped again and discussed sacred geometries and the fact that all the sects listed use prime numbers. We also noted that in Genesis 2:22 it says “rib taken from the man and made woman”. We also noted that 2 is the only even prime number and that it was referred to as “snake eyes”. In Genesis 3:5 (the 3/5 code in mind) it says “your eyes shall be opened and ye shall be as the gods”, referring to the temptation of the serpent in Eden — a serpent that may very well represent the coiling DNA. Q: (L) Are we thinking in any of the lines of something we ought to follow, or are we drifting? A: All are lines you ought to follow. “Immortality is one of the qualities we ascribe to people without having a sufficient understanding of their meaning. Other qualities of this kind are ‘individuality’, in the sense of an inner unity, a ‘permanent and unchangeable I’, ‘consciousness’, and ‘will’. All these qualities can belong to man, but this certainly does not mean that they do belong to him or belong to each and every one. “In order to understand what man is at the present time, that is, at the present level of development, it is necessary to imagine to a certain extent what he can be, that is, what he can attain. Only by understanding the correct sequence of development possible will people cease to ascribe to themselves what, at present, they do not possess, and what, perhaps, they can only acquire after great effort and great labor. Gurdjieff’s idea was that it was possible for these four bodies to exist because the physical human body has such a complex organization that, under certain favorable conditions, a new and independent organism can actually can develop and grow within it. 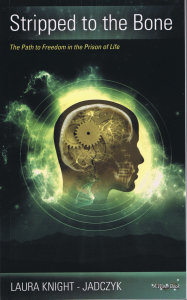 This new system of organs of perception can afford a more convenient and responsive instrument for the activity of an awakened consciousness. “The consciousness manifested in this new body is capable of governing it, and it has full power and full control over the physical body. “In this second body, under certain conditions, a third body can grow, again having characteristics of its own. The consciousness manifested in this third body has full power and control over the first two bodies; and the third body possesses the possibility of acquiring knowledge inaccessible either to the first or to the second body. “In the third body, under certain conditions, a fourth can grow, which differs as much from the third as the third differs from the second, and the second from the first. The consciousness manifested in the fourth body has full control over the first three bodies and itself. “These four bodies are defined in different teachings in various ways. The first is the physical body, in Christian terminology the ‘carnal’ body; the second, in Christian terminology, is the ‘natural’ body; the third is the ‘spiritual’ body; and the fourth, in the terminology of esoteric Christianity, is the ‘divine’ body. In theosophical terminology the first is the ‘physical’ body, the second is the ‘astral’, the third is the ‘mental’, and the fourth the ‘causal’. “In the terminology of certain Eastern teachings the first body is the ‘carriage’ (the body), the second is the ‘horse’ (feelings, desires), the third the ‘driver’ (mind), and the fourth the ‘master’ (I, consciousness, will). “Such comparisons and parallels may be found in most systems and teachings which recognize something more in man than the physical body. But almost all these teachings, while repeating in a more or less familiar form the definitions and divisions of the ancient teaching, have forgotten or omitted its most important feature, which is: that man is not born with the finer bodies. They can only be artificially cultivated in him, provided favorable conditions both internal and external are present. “The ‘astral body’ is not an indispensable implement for man. It is a great luxury which only a few can afford. A man can live quite well without an ‘astral body’. His physical body possesses all the functions necessary for life. A man without ‘astral body’ may even produce the impression of being a very intellectual or even spiritual man, and may deceive not only others but also himself. “When the third body has been formed and has acquired all the properties, powers, and knowledge possible for it, there remains the problem of fixing this knowledge and these powers. Because, having been imparted to it by influences of a certain kind, they may be taken away by these same influences or by others. By means of a special kind of work for all three bodies the acquired properties may be made the permanent and inalienable possession of the third body. “The process of fixing these acquired properties corresponds to the process of the formation of the fourth body. 1 Tesseracts are 4D analogs of cubes and are discussed in Riding the Wave.